I was in Nairobi for three nights at the end of April. Every evening, Cumulus clouds built up to a wonderful thunderstorm. These remind me so much of my childhood in Swaziland. On the second evening, members of the Board of AIDSpan were invited to Executive Director, Kate MacIntyre’s home outside Nairobi. Here we enjoyed an excellent dinner with the sound of the rain on the tin roof of the dining room: another evocative experience. It is all too easy to forget how disruptive and unpleasant the storms are for people living in shacks which many do in Kenya. The meeting finished on Sunday afternoon. I took the opportunity to go to the gym at the Jacaranda Hotel before leaving for the airport. It is difficult to do more in the time available and the gym is a real sanity saver for me. My flight, KLM to Amsterdam, was scheduled to depart at 10:30 pm so I calculated that leaving Nairobi city centre three hours before the flight would give me ample time to check in. While at the gym, a relatively mild thunderstorm and some gentle rain seemed insignificant. By the time I got into the taxi to head for the airport, there was a downpour, accompanied by sheets of lighting and cracking rumbling thunder. Heavy rain drumming on the roof of the vehicle was not reassuring. The taxi company cars are not in the greatest shape, although the drivers are careful and competent. We set off on, what the driver suggested, would be a 40 minute journey. He was hopelessly optimistic. The roads were flooded; the traffic was at a standstill. Red brake lights ahead as far as the eye could see. Where there was a slope, there were torrents of water, and where there was no gradient there were vast muddy pools. In places, the water was so deep that it was over the door sills. Had we fallen into one of the notorious Nairobi potholes it would have been a case of ‘sunk without a trace’! The rain bucketed down and the windscreen wipers were ineffective. On the inside of the windscreen there was a constant sweaty build-up of moisture and mist: it was virtually impossible to see the road and the traffic. I swear the drivers have to have some sort of extra-sensory perception that allows them to avoid hitting the vehicles around them. My man had a pathetic piece of newspaper to wipe his window. I pressed my handkerchief into service and kept wiping the windscreen. By the time I left the vehicle it was a sodden rag. All was made tenser by the fact that the driver was quite small, peering through the steering wheel rather than over it. As the journey progressed he apparently shrank, no doubt with the additional weight of responsibility from my infectious anxiety and urgency. We made it to the airport in time, by dint of some desperate, imaginative driving with inspired diversions, including one through the suburbs, where a washed away wall had to be cleared by the drivers ahead of us. There were massive stones in the middle of the road. Fortunately, because of the traffic, we had to go quite slowly. It was altogether one of the most harrowing journeys I have made and I am a Swazi boy used to fog and precipitous roads cheerfully tackled by boy racers in dodgy vehicles blindly but cheerfully overtaking equally dodgy trucks. I had a second journey before heading back to Waterloo, this time to Switzerland. It was more relaxing. I flew to Geneva airport for a UNAIDS World Bank Economics Reference Group meeting. We were in a rather smart hotel in Montreux. This is the town where the big jazz festival is held and there is a wonderful statue of Freddy Mercury on the lakefront. The trip did not have an auspicious start. 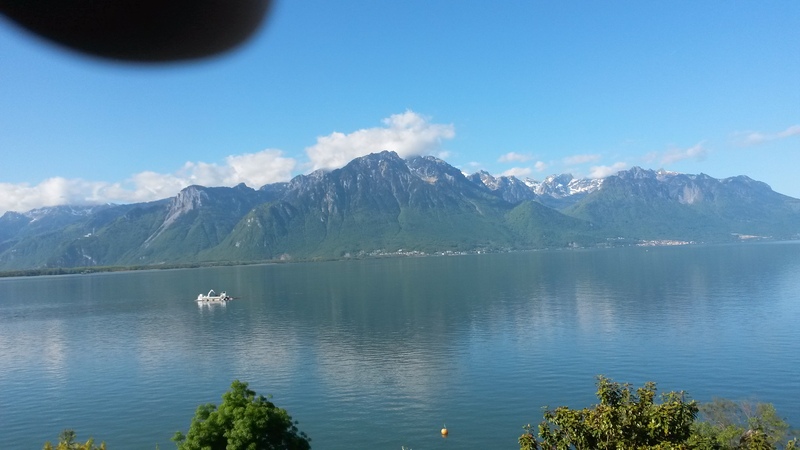 I got off the plane in Geneva and bought a return ticket to Montreux without difficulty; there was a train about to leave so I was able to hop on it. About 15 minutes into the journey I realised that I had left the folder, with the details of the hotel in the seat pocket on the plane. After thinking about the problem I decided I could get the information from an email message so all was not lost. There was no WiFi on the train so that was not a short term solution. I was able to text a friend, who was to be at the same meeting, and get the information. When I reached the hotel I realised I had left my Sunday paper on the train. I enjoy the in depth articles and analysis in British Sunday’s, so this was very annoying. It was an interesting meeting, and just being a member of the group rather than a convener is a pleasant change. The main message of these meetings is, that for some countries, the bill for AIDS treatment simply cannot be met from the national exchequer. This raises many questions about how this can be achieved? How will this dependency be experienced: how is a nation’s psyche affected by dependency over the foreseeable future? This is sometimes summed up as the ‘Malawi question’. It is an issue which is being addressed in an imaginative fashion by my colleagues at the Rush Foundation (another website worth visiting). Unfortunately we do not have any answers as yet, although it should be obvious that prevention must be a priority. The weather was mostly good, the trees were in leaf and blossom. I went running two nights in a row with Mark Bletcher (a friend who is a senior civil servant in South Africa’s Treasury). The first evening an older colleague ran with us, which, I am happy to say, meant the pace was comfortable. The next evening we were joined by a young economist. That was tough as he was fit and fast. We ran round the lake to an amazing Chateau build on an island. This is, for English speakers and readers, significant as it was visited by Lord Byron, who wrote the poem The Prisoner Of Chillon in 1816 about François de Bonivard, a monk and prior of St. Victor in Geneva. Bonivard spent six years in prison there from 1530 for ‘defending his homeland from the dukes of Savoy’. On a more practical note, it was just over 2.5 kilometres from the hotel to the Château making it a good 5 km run. Mark and I added a bit extra on the one evening, so that when I enter the 10 km run in Waterloo in a month or so I will have done at least a little training. On both evenings it was warm enough to run in just a T-shirt and short. To be skirting the lake in shorts, with the snow-covered Alps as a back drop, was indeed a huge privilege. I have put a couple of photos up. I am increasingly aware of how lucky I have been in my career in being able to travel so extensively. Back in Norwich, Douglas celebrated his 21st birthday. This is a real milestone for him and us. We took him out for lunch to a pub to the south of Norwich, where the landlord refused to sell him an alcoholic drink, just half a pint of lager, because he did not have identification on him. How very ironic. Douglas was born on 9 May 1994. The day before Nelson Mandela was inaugurated as the first democratically elected president of South Africa. Rowan was three and a half and I took her into the voting booth on the 27th April, saying to her, “remember this day.” It is not an easy environment to be coming to maturity in. I suspect that it is less forgiving than it was in my day although there are better safety nets in some countries. I am proud of both of them; they are solid and caring citizens. Rowan works at The Writers’ Centre in Norwich and is very involved in their Brave New Reads programme. There is a vibrant, intensive mix of events around three counties: Norfolk, Suffolk and Cambridgeshire. Ailsa and I went to a launch event at The Forum – the main library in the city. The featured author was Hamid Ismailov, who was talking about his latest book The Dead Lake. This is set in Kazakhstan and tells of the Soviet nuclear testing programme and the devastation it caused through the story of one person’s life changing exposure to toxins. I bought but have not yet read the book. Ismailov describes it as a celebration of human ingenuity and culture, surviving and enduring what ever is thrown at it, phlegmatically and stoically. The author, thoroughly integrated into our culture, nevertheless paid tribute to the idiosyncrasies and mystic elements of an oral tradition that is quite foreign to modern day Britain. One of our Sunday activities is to take the dog for a walk in a local wood. Unusually, there was an adder in the path. Maimed, it looked as though someone had taken a spade and chopped its still wriggling tail, in two writhing pieces. We puzzled squeamishly over this, concluding that it may have been sliced by a bird. This is the second time I have seen an adder on a walk in this area. The mixture of trees and sandy soil probably creates an ideal habitat for the snakes. I hope that there was enough of the creature left for it to survive; Ailsa was able to encourage it to slither into the undergrowth. In the next blog, thoughts on the UK election! The Tories unexpectedly won a majority and the Scottish National Party swept the boards in Scotland! I need to think about it more it is significant. This entry was posted in Blog and tagged AIDSpan, Family, Geneva, Kenya, Montreux, Nairobi, Norwich, Rush Foundation, Switzerland, UK, UNAIDS. Bookmark the permalink.